OK, maybe Mary is feeling certain … feelings for legendary Broadwayman Ken Kensington, feelings that have never been stirred by ostensible longtime semi-boyfriend Dr. Jeff. If the introductory quote from notorious erotica writer (eroticist? erotica-ist?) Anaïs Nin isn’t enough of a clue, how about the fact that Mary is thought-ballooning about him for four straight panels? Obviously she can’t bring herself to actually visualize the act of s-e-x, but the fact that her reverie begins with a display of monstrous bones seems significant. 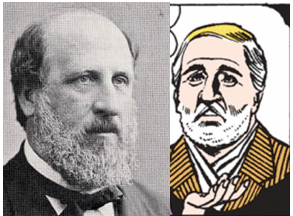 Oh my God, Ken is really notoriously corrupt 19th century New York political boss William Tweed! The most striking difference between these two images — Tweed’s baldness — explains why “Ken”’s hair is a weird, buttery yellow: because it’s a terrible, terrible Gilded Age toupee. 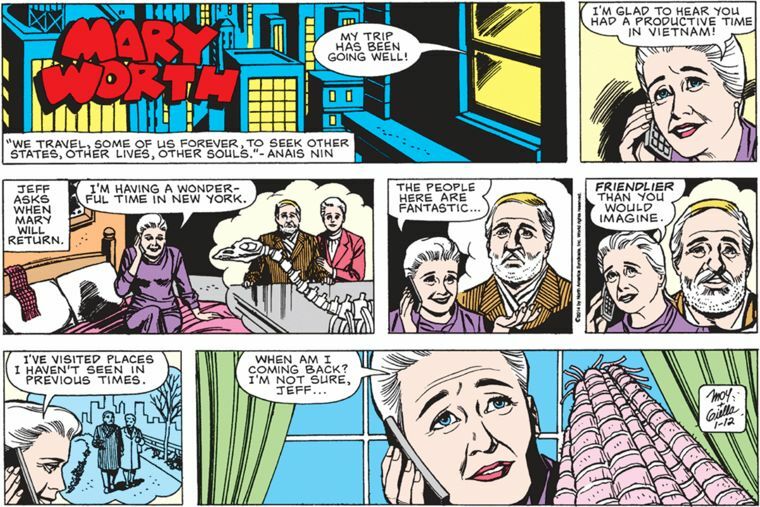 I’m not sure by what means Boss Tweed has hurtled himself forward to the 21st century to romance our Mary — time travel? suspended animation? chrono-witchcraft? — but it’s clear that an upstanding citizen like Mary could never get mixed up with anyone who was the object of such ire from Harper’s. Their love can never be. 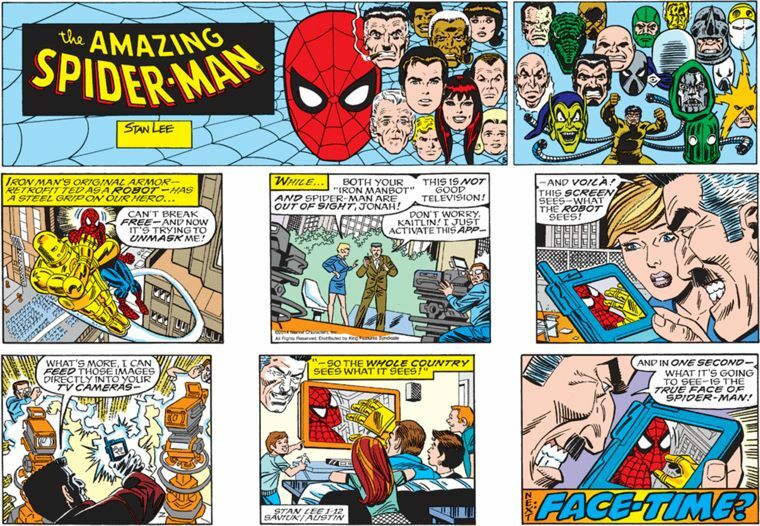 Um, JJJ, I know it’s cool to have spent your newspaper’s copy editing budget for the year on a powerful gadget that can override a TV camera’s feed with its own video stream, but probably you could’ve just talked to the network’s producers ahead of time and set all this up in advance? Also, “FaceTime” is a registered trademark of Apple, Inc., so expect a sternly worded letter from their legal department, narration box, hyphen or no.